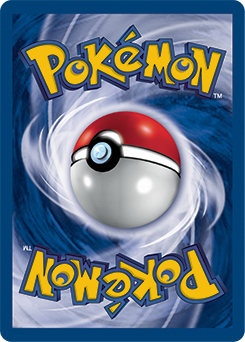 With the recent release of the Towering Splash GX Box, the Pokemon with the largest amount of HP will soon be Standard legal. Coming in with a whopping 300 HP, Magikarp & Wailord-GX PR-SM SM166 will soon be a valuable tool for stall decks to utilize. As a result, decks in Standard will need to be able to figure out ways to deal with this massive wall. One such possible way is with the use of Kingdra-GX DRM 18. While browsing through the forum on PokeBeach.com, I came across the following deck list created by JAlexanderL that features Kingdra-GX DRM 18. Let's take a look at the deck. Kingdra-GX DRM 18 is the star of this deck. 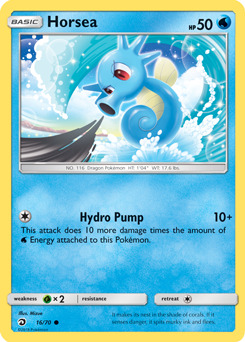 With its Hydro Pump attack you have the potential to deal a massive amount of damage. By using it, you can deal anywhere from 60 damage all the way up to the 300 needed to knock out Magikarp & Wailord-GX PR-SM SM166 in one hit with relative ease. And while Hydro Pump will likely be your main attack with Kingdra-GX DRM 18, don't forget about Reverse Thrust. It's a great way to switch out a Kingdra-GX DRM 18 that's taken a fair amount of damage with a fresh Pokemon. One final note, while Kingdra-GX DRM 18 isn't the only Pokemon-GX in the deck, it is the only one that can easily use its GX attack. 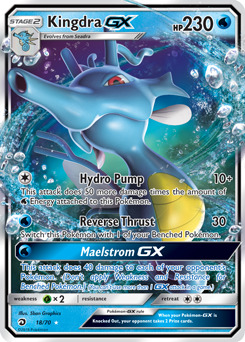 So feel free to use its Maelstrom GX attack whenever you're able to KO one or more of your opponent's Benched Pokemon. Even though you might potentially be able to use Tapu Lele-GX GRI 60's Tapu Cure GX attack and heal up a couple of wounded Kingdra-GX DRM 18s, it's very difficult to do, while attacking with Kingdra-GX DRM 18's Maelstrom GX attack will be simple to accomplish. 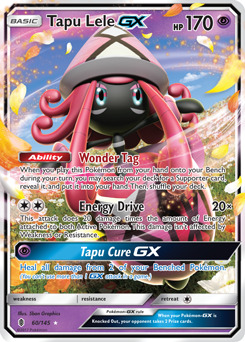 Speaking of Tapu Lele-GX GRI 60, its main purpose will be to search up a Supporter card from your deck. 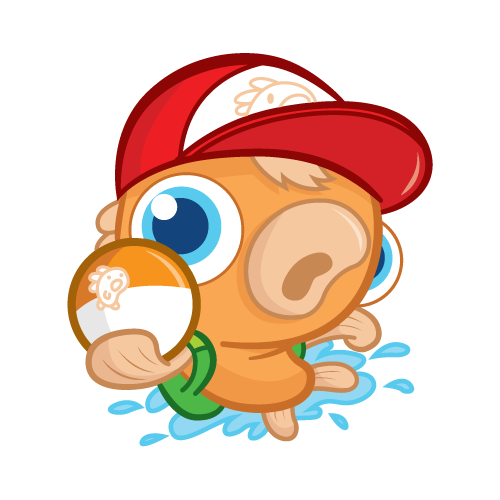 The best choice will be to find Cyrus Prism Star UPR 120, but if finding him isn't possible because he's in your Prize Cards, finding a Supporter that allows you to draw additional card is never a bad choice. 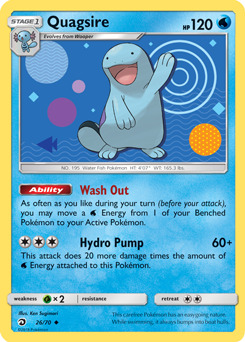 Quagsire DRM 26 is the engine that could in this deck, allowing you to transfer Water Energy from your Benched Pokemon to your Active Pokemon. 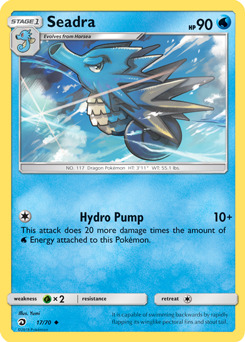 This is very crucial so that Kingdra-GX DRM 18 has enough energy to one-hit knock out (OHKO) any Pokemon that your opponent makes their Active Pokemon. Rare Candy SUM 129 acts as an added way to evolve your Horsea DRM 16 into a Kingdra-GX DRM 18. 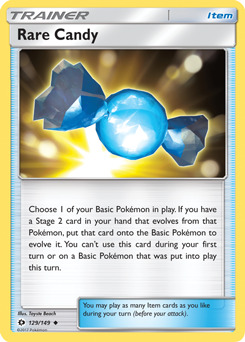 If you've evolved the hard way, this can be discarded when you play an Ultra Ball SUM 135. 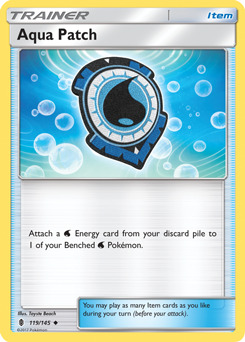 With Aqua Patch GRI 119 you're able to get a Water Energy that you either discarded or that was attached to a Pokemon you had in play that got knocked out and attach it to one of your Benched Pokemon. With water conservation techniques like this, you can certainly expect your win percentage to grow. It's no surprise that Cynthia UPR 119 is a great Supporter. 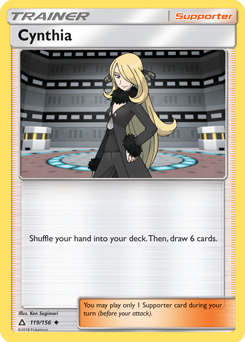 She'll help you get rid of cards in your hand that aren't useful currently and replace them with six brand new ones. Judge FLI 108 is very similar, but it affects both you and your opponent. Tate & Liza CES 148 is also similar, but comes with an added effect. When in doubt, save Tate & Liza CES 148 to play after Cynthia UPR 119 and Judge FLI 108 whenever possible. Tate & Liza CES 148 might help you if you need to switch your Active Pokemon with one from your bench. So will Switch SUM 132. 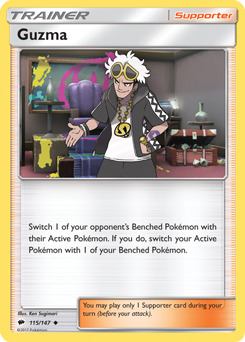 Guzma BUS 115 does that as well plus it also switches your opponent's Active Pokemon with one of their Benched Pokemon of your choosing. Take advantage of that by bringing up one of their weaker Pokemon if possible for a OHKO. While I mentioned Ultra Ball SUM 135 earlier as a way to find any Pokemon you need, it's better to save this Item to find an evolution you might need. 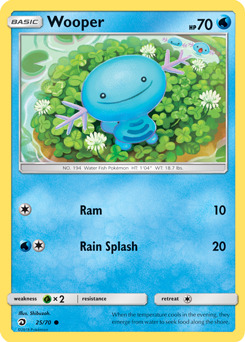 This is especially true if you happen to have Brooklet Hill GRI 120 in play as Brooklet Hill GRI 120 allows you to find whatever Basic Water Pokemon you need each turn. 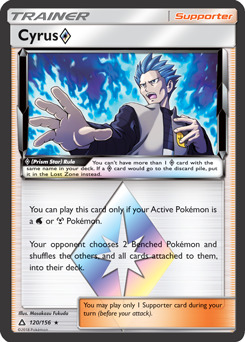 Cyrus Prism Star UPR 120 is very easy to play in this deck and is a great way to remove troublesome Pokemon from your opponent's Bench. 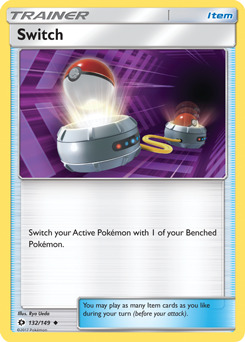 Remember though, the opponent gets to choose which of their Pokemon get shuffled into their deck so they'll choose the ones that they find expendable as long as they have more than two Benched Pokemon. Since you rely so heavily on Kingdra-GX DRM 18, Shrine of Punishment CES 143 can really hinder you. Luckily Field Blower GRI 125 is here to save you from that punishment. 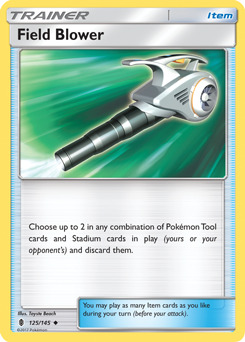 It can also be used against decks that rely on using a lot of Pokemon tools if you happen to face one of them. 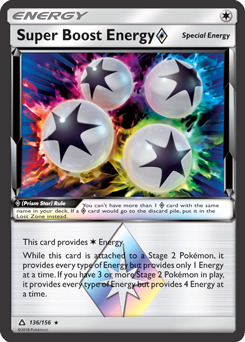 Super Boost Energy Prism Star UPR 136 is a great way to be able to use Tapu Lele-GX GRI 60's Tapu Cure GX attack. 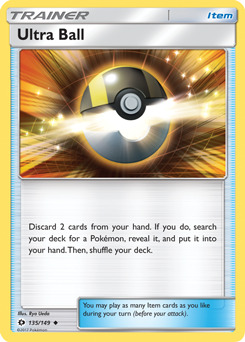 Since you need three Stage 2 Pokemon in play for it to provide more than one energy and you only have Kingdra-GX DRM 18 as your Stage 2 Pokemon, it will be challenging to utilize this card more than that. One suggestion for a change to this deck would be to include Switch Raft DRM 62 instead of Switch SUM 132. 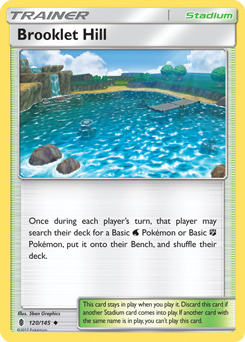 This makes a lot of sense as the majority of Pokemon in this deck are Water Type Pokemon and Switch Raft DRM 62 does the same this as Switch SUM 132 in addition to healing a Water Type Pokemon. 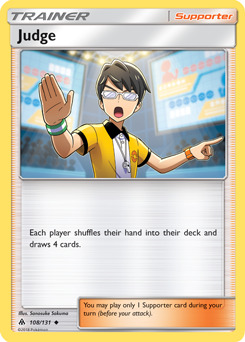 Thank you to PokeBeach.com Forum user JAlexanderL for posting this decklist.